Valeria and Fred live in northeast PA in the Endless Mountain area just up the road from Camptown. It is a beautiful area and a dream come true for nature lovers. They bought a hundred-year-old farm house in 2003 and have extensively remodeled it, including building Val’s quilting studio (not to mention remodeling two existing rooms to make separate sewing and fabric dyeing rooms for Val!). Val is a Gammill sales representative with the Threads Run Thru It network out of Virginia. She also teaches a variety of classes including quilting, fabric dyeing, piecing, and applique. Val was involved with the Greater Wyalusing Chamber of Commerce. The Chamber has a very active barn quilt tour program with 200+ hand-painted barn quilts throughout Bradford County. Stop by the Chamber office in downtown Wyalusing to get information about the tour. 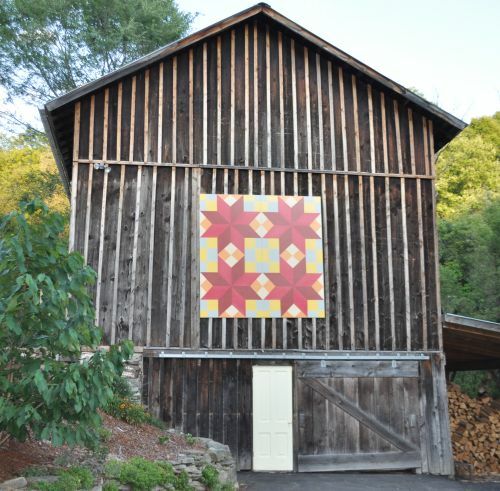 Val and Fred have six barn quilts on their property including the one in the photo to the right. While Val spends a great deal of her time quilting and piecing, her husband Fred is a woodworker. In addition to remodeling the house, Fred makes unique items for quilters as well as wood art in his studio. Check out his web site to see what he does. Both Fred and Val are avid book readers, enjoy gardening and ride their tandem bicycle as often and as far as possible. Read about Val and Fred's tandem bike riding trip in New Zealand, or, if you have hours of free time, ask Fred (the attached article is shorter! ).